The Royals were the story of the tournament, as the team had only been playing together a short time before the event began. Douglas’ championship got off to a rough start with two tough losses on day one, but they got their game together and put together impressive performances the rest of the way. 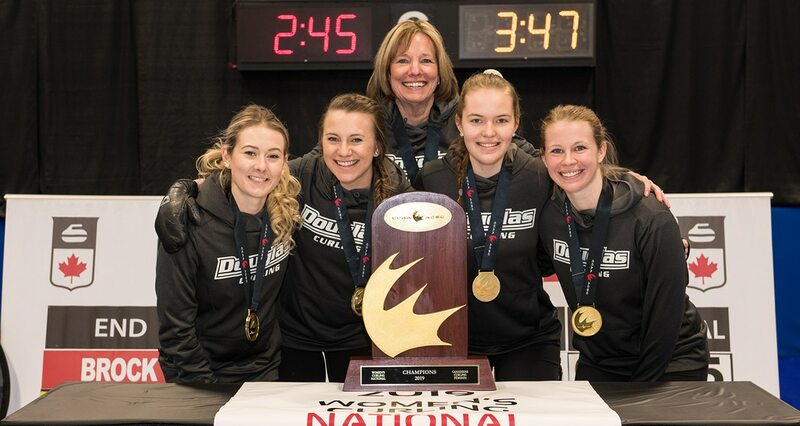 On the bronze side of the bracket, the Fanshawe Falcons faced the Augustana Vikings. The match was a conservative affair with Fanshawe holding a 3-2 lead on the Augustana Vikings entering the ninth end. Augustana scored two in the ninth to move ahead but Fanshawe grabbed countered with one in the tenth end to force an extra end. With the bronze medal on the line Augustana used the hammer to score one in the 11th and win the match 5-4. The Vikings were led by Hanna Terry led (85%), Katelyn Skolski (80%) and Sara Paulgaard (80%) while Lauren Massey (82%) and Kaitlyn Poirier (79%) curled well for the Falcons. The Concordia University of Edmonton Thunder’s dominant play led to a 10-4 victory over the Humber Hawks. All tournament long the Thunder were calculating in their play, adjusting to their opponents’ games and knowing when to strike. In the gold medal game those strikes came early and often with Concordia jumping out to an 8-2 lead on the Hawks after six ends. The Thunder scored doubles in the first and third ends and three points in the sixth. From there they settled in and did not allow the Hawks to get any momentum. 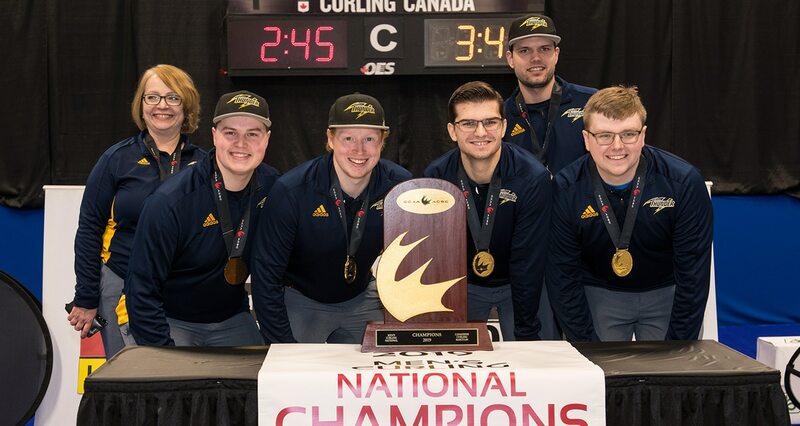 Humber put up a fight, scoring two in the eighth, but it was too little too late, and Concordia locked down 10-4 win and their first ever men’s curling national championship. In the men’s battle for bronze, the NAIT Ooks also scored in bunches with three in the second end, two in the third and four in the sixth to take a commanding 9-4 lead against the Fanshawe Falcons. The Falcons got one back but the Ooks held on for a 9-5 victory to win the bronze medal. Brett Winfield curled 95% and Jonah Tobinski 92% to lead the Ooks while Brady St. Louis had a good game for the Falcons checking in at 85%.